There was a time when Castlemourn surged and crackled with magic. Life was good, but the era came to a violent and deadly end. Unknown fell beings struck swiftly, making arcane war on Castlemourn. Wizards and common folk alike died in scores of thousands. It seemed as if the world would be consumed... until the land itself rose and cried, "Enough!" Today, Mournans dwell amid the ruined shards of their former greatness, calling the land Castlemourn, not remembering the time before the Fall. However, the land itself is restless,and long-lurking mysteries are stirring. Those brave enough wonder: Will the fell creatures return, bringing war? Who can now withstand them if they do? What dangers lurk in ruins all across mournra? Castlemourn needs heroes now more than ever. Mysteries abound across the lands, from the nearest pasture and woodlot to grim ruins avoided by sane folk. Join master storyteller Ed Greenwood - the famed creator of the world's most popular role playing setting - in this fantasy world rich in intrigue and adventure with a web of mystery and wonder to meet the tastes of any fantasy role player: those who slash their way to glory, those who revel in solving complicated puzzles, and those who wish to interact with a myriad of strange and interesting characters. Castlemourn has all of this and more! 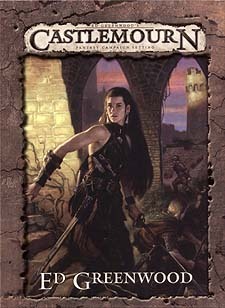 The Castlemourn Campaign Setting is a complete guide to the lands of Mournra. It contains everything needed to create characters and have adventures in the setting using the most current version of Third Edition rules. Also included are a fold out poster map and original fiction by Ed Greenwood.